I’m a private chef. But you know what I’d love in my life? My own personal chef to prepare a healthy and delicious breakfast for my family each morning. A personal chef is a dreamy idea, but the reality is that most of us live life on the go and we rarely have time for a long, relaxed start to the day. Most mornings, the best I can do is throw some fruits, veggies and other ingredients into the blender and race out the door, smoothie in hand. Which is probably not such a bad thing! 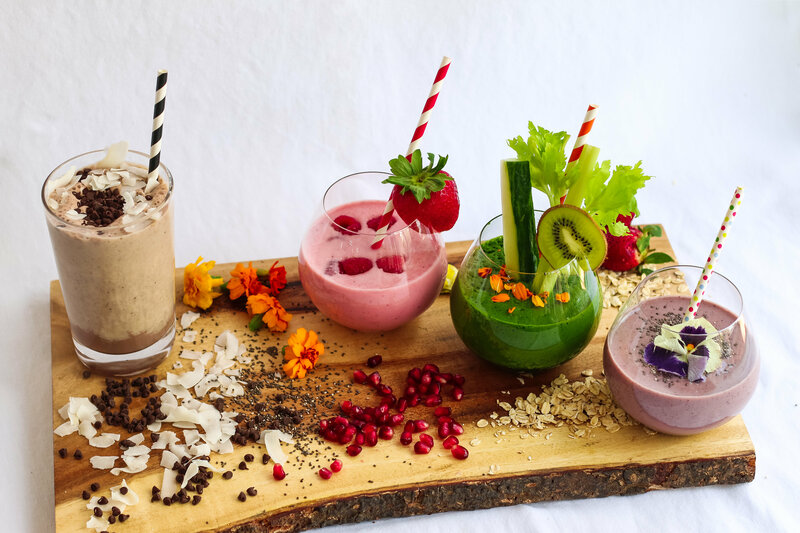 The great news is that the smoothie breakfast-on-the-go can be prepped in advanced and takes much of the hassle out of the morning! Here are some of my best tips and tricks and favorite combinations for smoothies that taste like an indulgence but are oh so good for you! 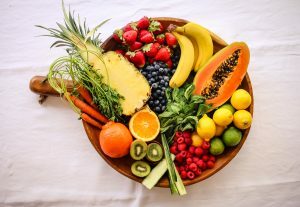 – Buy your fruits and veggies organic, fresh and local! Your neighborhood farmer’s market is a great place to start. But don’t let fruits and veggies go to waste. If they’re nearly too ripe, place them in containers and freeze. You can separate by ingredient or do a medley of your favorites. Freezing extends the life of your fruits and veggies, and you always have extra on hand, in case you forget to pick up basics at the market. Freezing sidenote: Something we always do – even if it’s not for smoothies – is peel and freeze ginger. This ensures you always have ginger in the kitchen and it’s easy to grate when frozen! 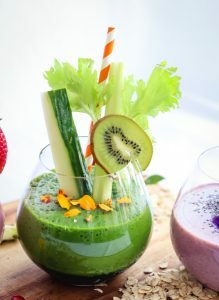 -Any blender will work for smoothie making, but if you have a little extra cash, invest in a good, powerful blender! I have a Vitamix and it’s been one of my best purchases! 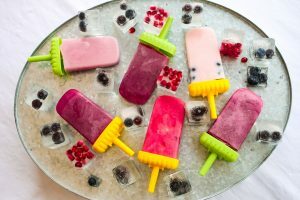 – If you have picky little ones who think they don’t like fruits and veggies, use Popsicle molds or small paper cups for frozen smoothies. Cuteness always wins! -Liquids: Coconut water, apple juice, orange juice, almond milk, coconut milk. All make healthy, tasty liquids for smoothies. – Nutritious Extras: High-fiber basics and protein ingredients. We love oatmeal, nuts, flax seeds, chia seeds, probiotics, turmeric powder, acai powder and on occasion, protein powder. 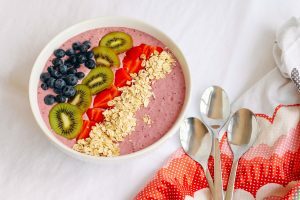 – Breakfast smoothie bowls are such a treat! Place yogurt in a bowl, add fresh fruit, coconut flakes, granola, oats, some raisins and seeds. These yummy bowls are satisfying and provide long-lasting energy. They’re also a healthy alternative to dessert! For more tips and tricks to simplify your life and make cooking (and smoothie making) a breeze, find us at The Mad Table website. And be sure to like The Mad Table on Facebook and follow us on Instagram for all the latest news, fabulous recipes and gorgeous entertaining tips and ideas.